The priority goal of my entire life has been to eradicate and abolish the killing of whales and dolphins by any human being for any reason, anywhere on the planet. Humankind's relentless and merciless slaughter of the gentle citizens of the sea has been an unforgivable and shameful indictment of our species. We are, and we continue to be, the savage primate monsters of the deep. This month, Robert Rocha the director of science at the New Bedford Whaling Museum in Massachusetts, together with fellow researchers Phillip Clapham and Yulia Ivashchenko of the National Marine Fisheries Service in Seattle, Washington, completed a paper on the math of whaling. The paper was published last week in Marine Fisheries Review (R. C. Rocha Jr, P. J. Clapham and Y. V. Ivashchenko Mar. Fish. Rev. 76, 37–48; 2014). For centuries humans have cruelly slaughtered millions of whales and the greatest numbers slain were in the 20th century. Between 1900 and 1999, 2.9 million whales were murdered in the seas of the world. 276,442 in the North Atlantic. 563,696 in the North Pacific and 2,05,956 in the Southern Hemisphere. The numbers may well have been much higher because these figures do not include struck whales that were not landed and many unreported whales taken illegally. Tracking down these numbers was difficult because the numbers reported since 1946 simply cannot be trusted, aside from the unreported depredations of pirate whalers like the Sierra, Tonna and others in the seventies. The Japanese and Soviet whalers took hundreds of thousands of whales in the sixties and did not report the total numbers to the International Whaling Commission. According to Yulia Ivashchenko, 178,811 whales went unreported by the Soviets during that decade. Also during the sixties, the Soviets reported killing 2,710 Humpbacks although the actual figure was over 48,000 Humpbacks. Back in 1976 at a whale conference in Bloomington, Indiana, I had the great pleasure to meet and speak with Dr. Alexey Yablokov, the leading Soviet whale scientist at the time. I told him then that I had personally documented the killing of a juvenile Sperm whale by the Soviet whalers in the North Pacific and I asked him point blank if the Soviet Union was being honest about their kill figures and the legality of their catch. He smiled at me, spoke in Russian and his interpreter translated, "What do you think?" I said I thought the figures were dishonest, an answer that a couple of America attendees with me considered rude. Yablokov however was not angry. He did not argue. He simply smiled and walked away. In 1992 Robert Brownell of NOAA's National Marine Fisheries Service, mentioned to Yablokov that South African biologist Peter Best was having a research problem for a paper he was writing on Southern Right whale pregnancy because the available sample sizes of Southern Right whales were so small, as the species had not been hunted since receiving international protection in 1935. Yablokov's response took Brownell by surprise. "Alexey told me that he could give Peter some data on right whale fetuses," says Brownell. "When I asked how many, the answer was several hundred." Brownell was astonished. What Brownell discovered and what Yablokov had known was that more than 3,000 Southern Right whales had been killed by the Soviet fleet in the sixties under the directorship of the Soviet whaling enterprise of Alexei Solyanik, who was even more ruthless than that great whale killer Aristotle Onassis. This slaughter of over three million whales slain in the 20th century represents one of the gravest crimes that humankind has inflicted upon nature and it will have consequences. Blue whales depleted by 90 percent. Two thirds of all Sperm whales wiped out. 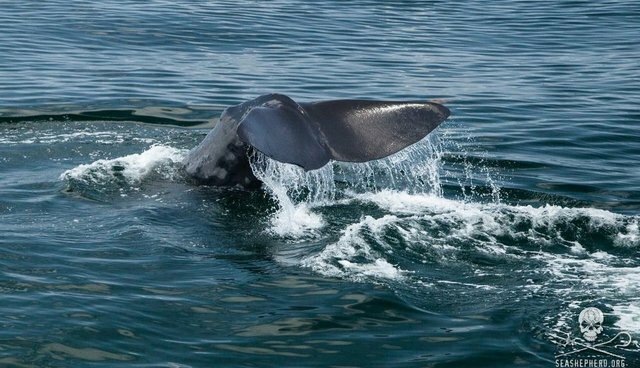 Right whales on the brink of extinction. The immensity of this massacre has caused problems, one of which is the removal of great numbers of animals that converted zoo-plankton into iron-rich nutrients to be returned to the sea for the benefit of phyto-plankton. Industrialized whalers were methodical and efficient and even worse, totally devoid of empathy or awareness of the consequences of their greed. They simply did not care, just as the Japanese dolphin killers of Taiji, the Faroese pilot whale killers, the Icelandic, Norwegian, and Japanese whalers simply do not care today. Whaling continues today by Japan, Norway, Iceland and Denmark primarily. The pride of the Samurai and the stubbornness of the Vikings may well finish off what the mass murdering industrialized whale killers of the 20th Century did not fully complete - the eradication of the world's whales. Unless, as a movement, we continue our efforts to instead eradicate the ecological insanity of whaling and to abolish it forever, to toss it on the rubbish heap of humanity's barbaric history and to learn to embrace these great minds, these wondrous sentient, social beings of the sea. Sea Shepherd volunteers have saved thousands of whales and dolphins over the last four decades in our attempts to absolve our species of absolute shame and disgrace. We shall continue to do so, no matter what the obstacles may be or how formidable the killers and their supporters appear to be. Our clients are the whales and the dolphins and we must and we will continue to represent their interests and to defend their lives with courage, imagination, conviction and with passion. To learn more about whaling, please read Phil Clapham and Yulia Ivaschenko's "A Whale of a Deception."